The Beaufort Fountain is a three tier fountain with beautiful a beautiful pineapple finial, classic yet bold fountain. Water then overflows the smallest bowl, into the second, just before flowing into the large basin below. The basin is made of durable fiberglass with cast stone coping that encompasses the circle. The Beaufort Fountain 68.5 inches tall, 104 inches in diameter, and weighs 3,454 pounds. 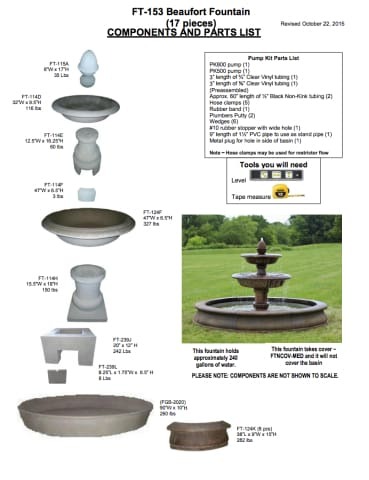 Recommended Fountain Cover - Medium - the cover only needs to cover the top two bowls, not the fiberglass basin. All Campania International pieces are stained to order. This process takes 10-14 business days to complete and to prepare for safe shipment. Order the Campania International Beaufort Fountain with free curbside delivery to your home from TheGardenGates.com today.